Henricks’ statement is striking for us because it reveals a trace of his own experience with the archive–doubtful, bewildered, and laced with humour–something that we could pick up with a similar spirit, over 20 years later. As emerging artists we have all held positions in artist-run organizations and view their history and lore as our own, often with a capital “R” Romantic view, and yet, women’s art practices and labour as administrators often share the predicament of being “unidentified” within broader systems of artist-run exchange. We mostly focused on older materials, as those are the ones that were the most surprising/interesting to us (and we are assuming that like us, most of our audience is already somewhat familiar with The New Gallery’s more recent activities and history). Also, many of the recent projects and exhibitions are already accessible through TNG’s searchable online database. 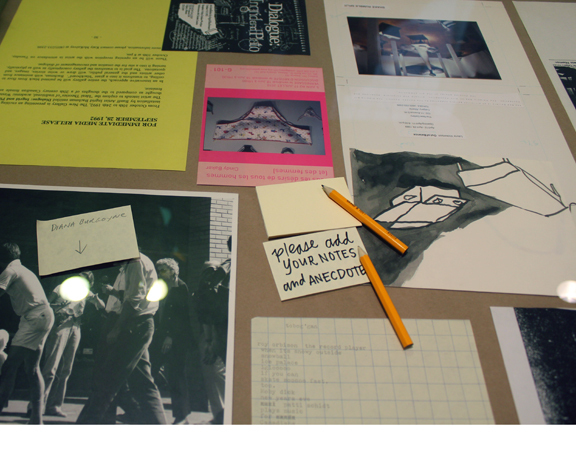 Initially, we began searching for objects and documents that fit into the broader themes of feminist and performance art (two terms/fields that are key references points in our own collaborative practice). These materials are presented on the first table and on the shelves: a collection of works, documents, performances, reviews, and texts of some of the performances and events represented in TNG’s archive. Eventually, in light of some of the discussions we hosted during the residency around topics of art and labour, we expanded our selections to include materials that reflected aspects of the administrative history and labour of The New Gallery: traces of the people and processes that have shaped the history of this artist-run space. These are presented on the second table. Given our own experiences within artist-run culture, we are interested in thinking about both the shifts and continuities in how artists and practices are selected, presented, and understood in these spaces. Alongside the documents themselves, the exhibition also includes a slideshow of photographs taken throughout the residency. These photographs document not only our activities during the residency, but also our interactions with various archival materials: we were literally cohabiting with the archive for 3 weeks, so it seems appropriate that it appear as a “character” in the story of our time at JSH. There is well-worn argument about the history and evolution of artist-run centres in Canada that points out how these organizations have become increasingly structured and institutionalized. Certainly the very existence of an archive representing over 35 years of activities suggests that The New Gallery, like many other similar centres, has not only achieved a certain level of stability, but that it also supports a commitment to preserving and sharing its distinct contribution to Calgarian and Canadian cultural heritage. At the same time, as third-generation artist-run members, we’ve been taught and mentored by founders of TNG and other Calgary organizations like Stride, TRUCK, and M:ST. This mentorship is steeped with the mythology of an earlier time in artist-run history, when things were supposedly run in a less structured and more organic or experimental way. Interestingly, a close reading of many of the documents from TNG’s early history reveals a more complex and contradictory narrative. The use of the term “curator” appears frequently in correspondence dating back to the early 80s – a framing of the role of an artist-administrator that shows a clear tendency towards wanting to be considered as more established or professional. The notion of a time that was less structured and more relaxed is both reinforced and undermined when examining the broad range of materials from this history: photographs of bearded men and ladies in long skirts smoking cigarettes at openings, picnics and trips to the beach exist alongside balanced budgets, detailed exhibition contracts, and meticulously typewritten letters referencing board meetings and concerns about proper procedure. Acknowledging all of these aspects of a centre’s community and activities means understanding its history and present in more nuanced ways. In this spirit, we invite you to look through these documents, to reflect on the history of The New Gallery, artist-run culture, and the spirit of collaborative and community-based artistic practice. 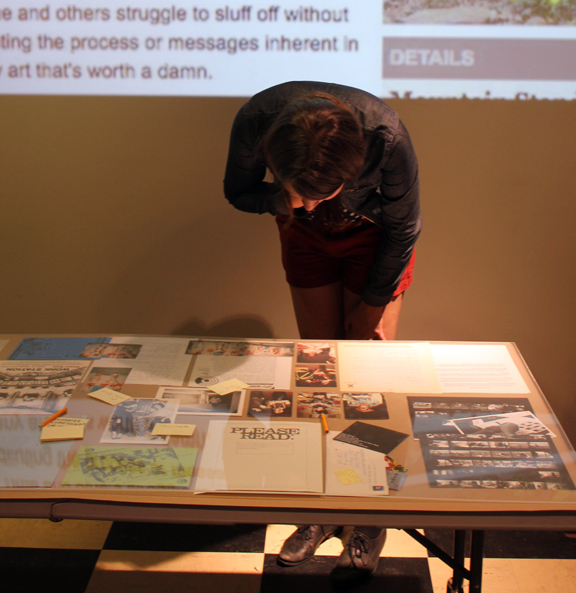 The full (annotated) list of materials included in the exhibition can be downloaded here.